Hoe hoe grow: But ... you're beautiful ! But ... you're beautiful ! I started thinking about what this time of year has to offer, in terms of colour, and, after a few rather enjoyable moments of self pity, I began to see the light. There is a fabulous group of plants in full throttle at the moment, often just taken for granted by gardeners. If I am honest, I have to admit that I have passed over them without so much as a glance for years, although I buy some for winter bedding every Autumn. I usually have a few pots at the back door, and haven't taken the time to really appreciate them. 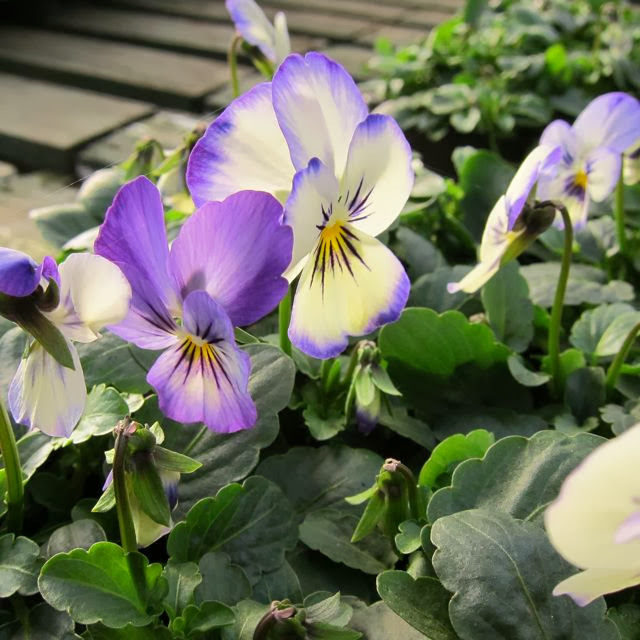 These plants are the poor old Viola, the workhorse of the winter garden, giving flashes of colour as we dash past them, enroute to the fire. I have never stopped to look, to really look, at those delicate little faces. To look them in the eye you need to get up close and personal. You need to kneel down and be on their level, to gently turn up those faces to appreciate them in all their glory. I think it was only when I looked at the photos I had taken, though, that I fully enjoyed the complexities of their colouring. 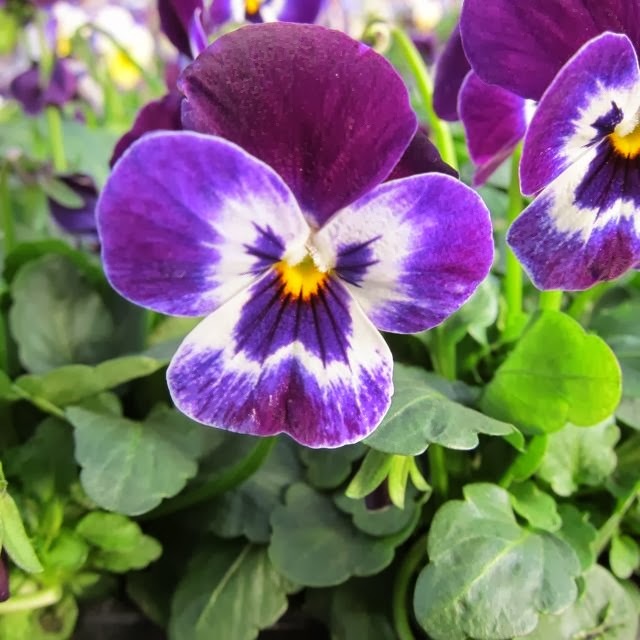 Violas look small, dainty and delicate, but their looks totally belie their true constitutions, because in reality they are tough, hardy, robust and strong. 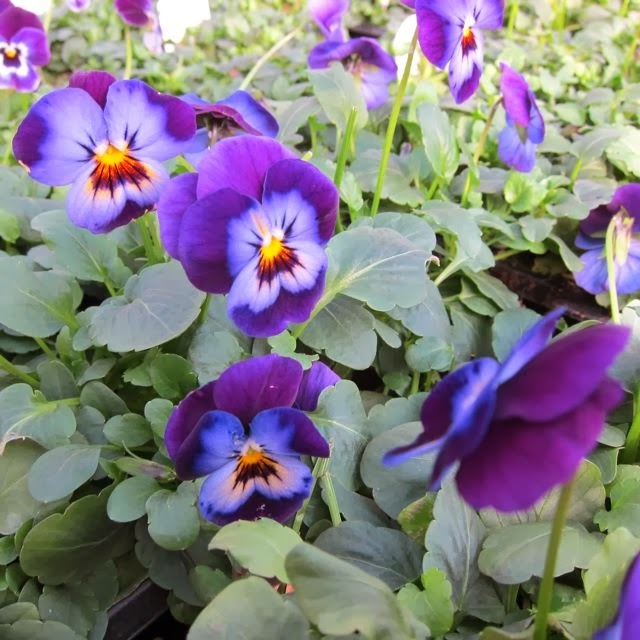 Violas spit in the face of frost and snow, they laugh in the face of cold. 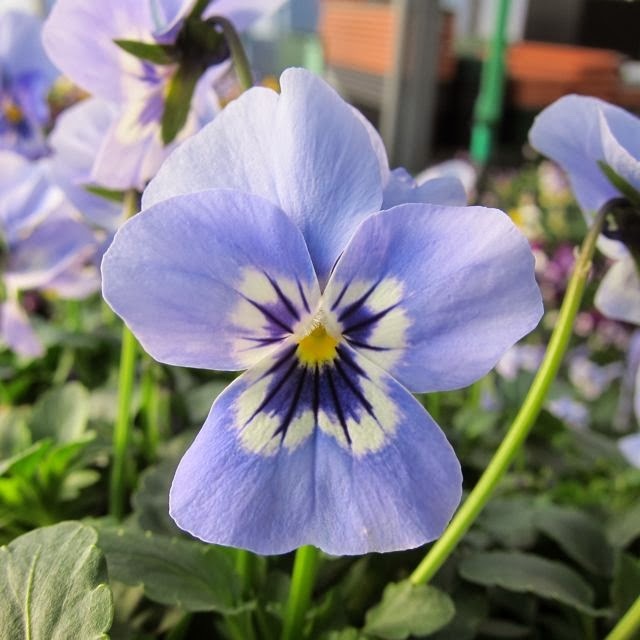 Viola Babyface Marina, pictured above, is the loveliest shade of pastel blue, shot through with rich, dark indigo, around a central yellow eye. It is hard to believe that this fragile, ethereal flower can withstand the worst of the winter weather. 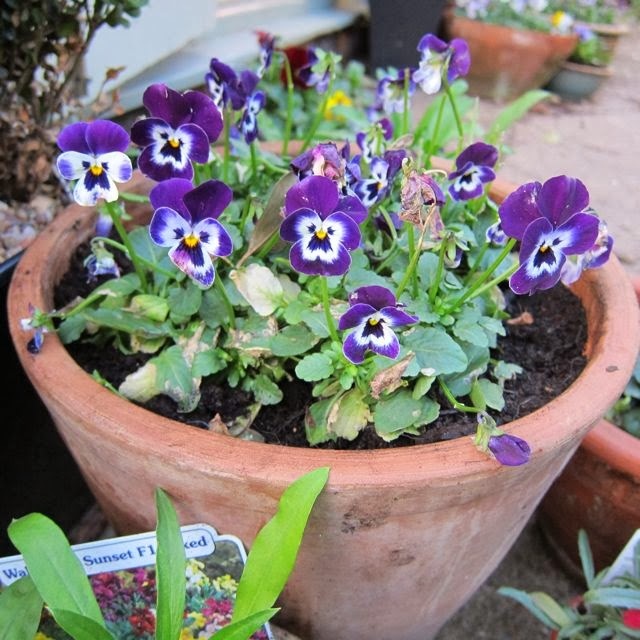 I was told a tale of violas today, where they reigned victorious, the only survivors in a garden decimated by the ridiculously low temperatures of the Winter of 2010. Apparently, even Buddleias struggled to survive, but the violas flowered on undaunted. Although the variety of base colours is huge anyway, the subtle patterns on the face are infinitely variable. Little cat-like faces shine out on gloomy winter days. There are pale, delicate colours like the ice blues and the lavenders, and then there are some 'in your face' colours too, gaudy rich yellows and oranges. They don't do it for me personally, but they bring colour to the garden when there is very little from anything else. Even the bright, gaudy colours have interesting, dark faces which give additional interest. I have kept my favourite until last - Viola Primrose Picotee, a very old fashioned, almost Art Deco looking flower. It reminds me of 1930's tea sets and embroideries. 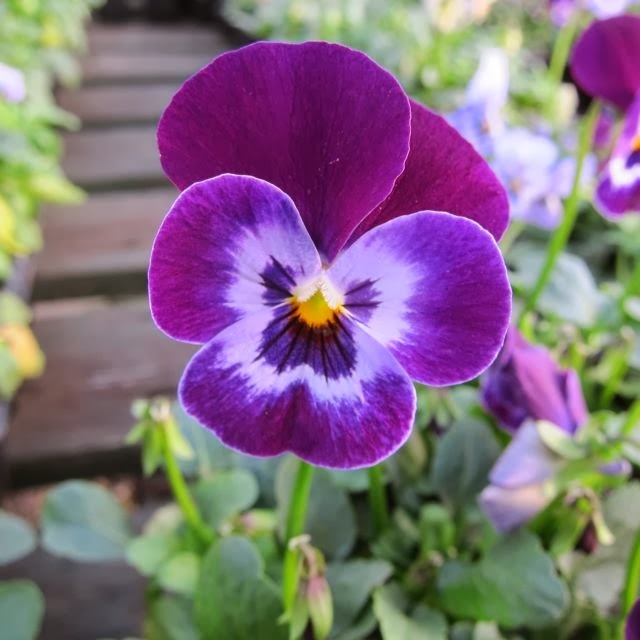 Violas are an easy plant to grow from seed and to look after. They grow very readily from seed, and once grown, need little work. 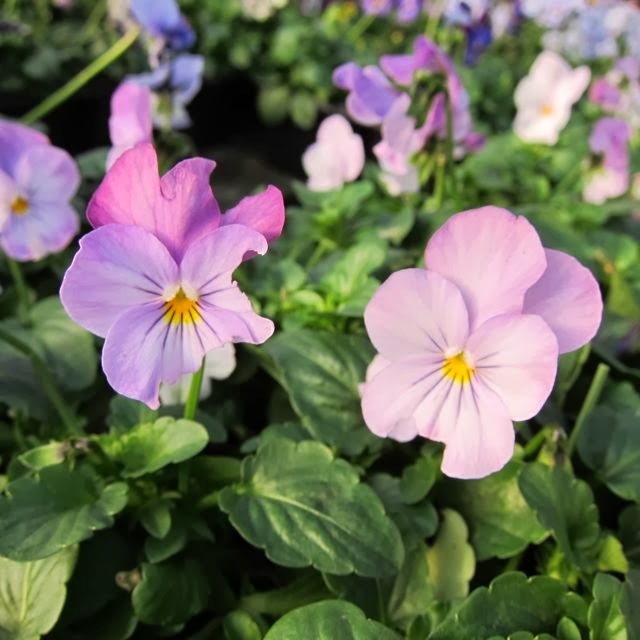 They need regular dead-heading, as for summer bedding, to maintain flowering. 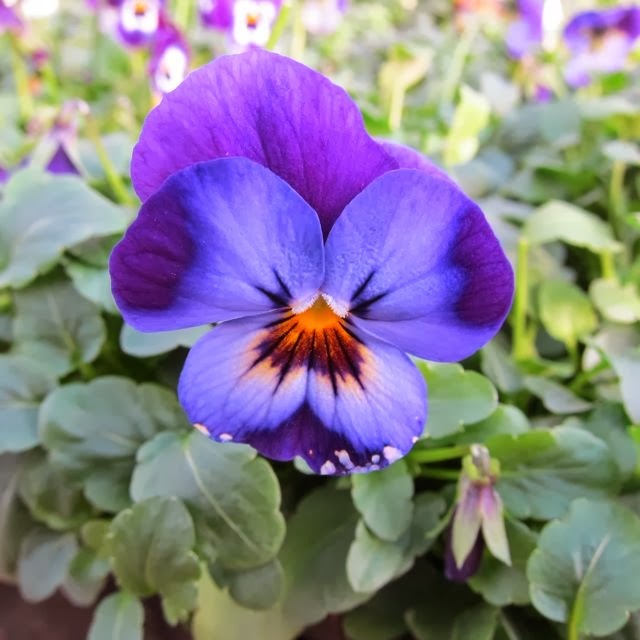 They also turn their heads to face the sun, and this needs to be taken into consideration when planting them, or siting pots, to ensure that their faces will be visible. 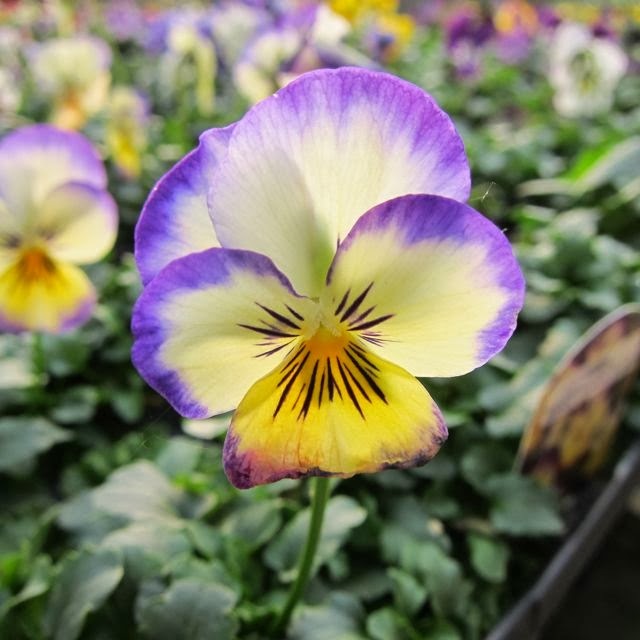 So, what's not to like about Violas ? Hardy, floriferous, varied and robust , the little workhorse of our winter gardens. I couldn't agree more. Violas are heroes. They flower for a ridiculously long time and some even make it through summer here to become perennial (but only in a cool, shady spot). I haven't ever grown any from seed, but even if you buy seedlings, they are more than worth the expense. Hi Lyn. They are fantastic. I am growing some from self-collected seed at the moment and the germination rate was terrific.One of my early New Year Resolutions is - must grow more !! Bratki,są śliczne kolorowe i lubię je mieć w ogródku. Są i z nasion , są i z kupionych wiosną sadzonek. Pozdrawiam. 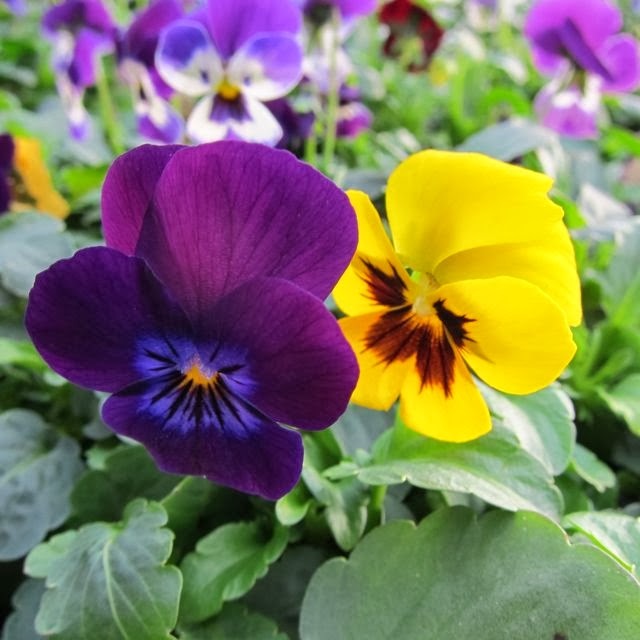 Pansies are beautiful colorful and I like to have them in the garden. They, and the seeds are purchased and spring seedlings. Yours. Hi Giga, thanks for your comments. They are wonderful, colourful plants . Hi Sally. I must asmit that I have only just learned to love them ! It has taken 30 years ! Lovely purple...i think I call them johnnie jump ups...happy gbbd! I know they are called that but not, I think in the UK, Wonder how they got that name ? They are so pretty!! Wish I could grow them here!!! Hi Stephanie. That is my line ! I think that eery time I pop across to your blog! What's still flowering out there ? And the winner is .... ?